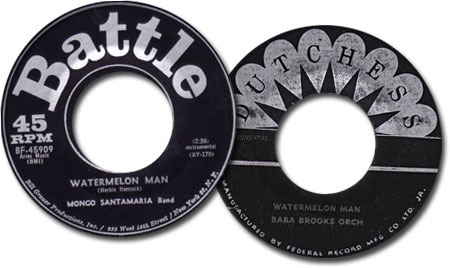 Herbie Hancock´s WATERMELON MAN for Blue Note became a hit for Mongo Santamaria. In Jamaica the cover version was recorded by Baba Brooks and his Orchestra. Mongo Santamaria "Get The Money" (Battle LP 'Watermelon Man' 1963) Marty Sheller Roland Alphonso "Passing Through" aka.